O.J. Simpson was subsequently acquitted of murder. Barry Roux is obviously not Johnnie Cochran. Gerrie Nel is not Marcia Clark. South Africa is not the United States. Yet the trial of Oscar Pistorius, like that of O.J Simpson has gripped the world to the point where interesting parallels have been drawn between them. Orenthal James “O. J.” Simpson is a retired American professional football player and actor. Following a lengthy and highly publicised trial, he was acquitted in 1995 of the murder of Nicole Brown Simpson, his ex-wife, and Ronald Goldman, her friend. 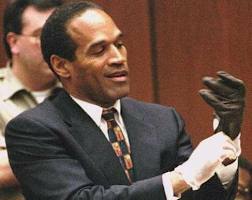 Various commentators have drawn comparisons between the trial of O.J. Simpson and the current trial of South African sprint runner, Oscar Pistorius. Both have a background in professional sport. Like Simpson, Pistorius has been charged with the murder of a glamorous blonde with whom he had a relationship. The trials of both have gripped the attention of the world and brought to the fore questions about the sincerity of modern criminal justice systems. In terms of evidence, things are also quite different: Simpson claimed to have not been at the house, so much of the evidence revolved around placing him at the scene. Pistorius, on the other hand, was at the scene and admits that he shot his girlfriend; he claims it was a mistake and that he shot what he thought was an intruder in self-defence and in defence of his girlfriend. If Pistorius’s girlfriend was staying over for the night, would he have expected her to lock herself in the bathroom when using the toilet? If he had premeditated the murder of his girlfriend, would he, in a fit of panic and fear, lie to the first person to arrive on the scene that he thought she was an intruder? Can neighbours in a different housing estate hear and identify screams over 100m away? If those screams were ‘blood-curdling’ as claimed, would the neighbours just go back to sleep? Would they neglect to call the police? Can we believe the testimony of a bitter ex-girlfriend, who claims he was trigger-happy and often screamed at her? Would a reasonable person, (without legs and living in South Africa) have felt as vulnerable as Pistorius alleges he did? To what extent can the court rely on forensic evidence which has been tampered with by the police and investigating details? Too early it is to answer any of these questions with certainty but these are a few scenarios where the glove may not fit comfortably for the prosecution. Clarity will only emerge once all the evidence has been led. What is certain, however, is that Pistorius is innocent, until proven guilty. To succeed, the prosecution must collect and present enough compelling evidence to establish that Pistorius is guilty beyond reasonable doubt. The media and the public must separate the emotion surrounding the tragedy from the question of criminal liability. If the evidence does not fit, the judge must acquit. Thank you for the short incisive piece. I am following the case with interest. Prof. Paul H. Gundani, Ph. D.; LL.B. This is one case that wound me up intensely and from the offset it was a murder case. I am not a lawyer but an ex-cop and throughout the police investigation it was clear that this was murder, this was not an accidental shooting or a mistake in identity – none whatsoever and everything showed this was with intent. A bloodied cricket bat, forensics showed that her skull was crushed by a heavy implement – that of a cricket bat, multiple blows to the head? The ballistics reports showed the trajectory of the round and that in itself was evidence, he knew exactly what he was doing, there is no doubt about it, whatsoever. Pistorious has previous for firearms, he is also known to have a terrible temper. When the reporting officers were taking statements from neighbours right at the beginning a few hours before the crime was committed Oscar and Reeva were having an argument – it was also said that Oscar is an extremely jealous person, Reeva had been spending time with another male friend of hers. It is a good thing this went back to court, I am however not happy with the sentence he got. It is basically an advertisement to murderers to kill someone, they only get six years and if they’re good little boys/girls they can get reduced down to good behaviour. What on earth is becoming of the law?